It was recently reporter that current UFC bantamweight champion Dominick Cruz injured his knee again and will be out even longer than scheduled. At the UFC 154 post fight presser, Dana White mentioned a possible title fight between current UFC Interim bantamweight champion Renan Barao and young prospect Michael McDonald if Cruz was going to be sidelined. The Interim UFC Bantamweight Championship will be defended in early 2013 with a yet to be determined date. In a report on Tuesday’s new edition of UFC Tonight on Fuel TV, UFC President Dana White confirmed that current Interim Champion Renan Barao will defend his title against top prospect Michael McDonald sometime after the new year. McDonald put himself on the radar with an impressive knock out of Miguel Torres at UFC 145, and now will be given the chance to become the youngest champ in UFC history. 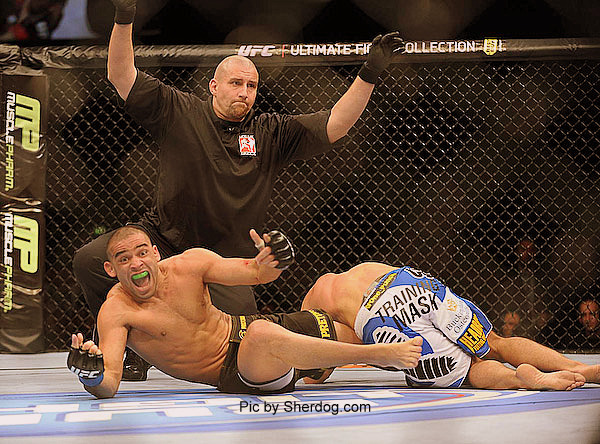 Watch Barao take out Brad Picket (also pictured above) in the video below. Video courtesy of the UFC and YouTube uploader Renan Barao. With Cruz sidelined, Should this fight happen?